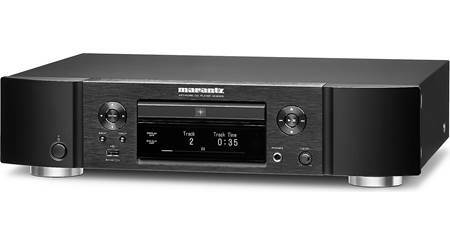 The Marantz NA6006 makes sure your digital files and music streaming sources sound excellent. 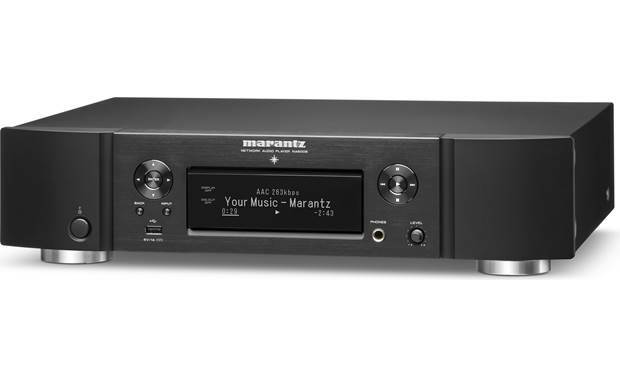 The Marantz NA6006 makes sure your digital files and music streaming sources sound excellent. Its high-performance built-in DAC helps make the most of "lossy" MP3s, and it offers impressive high-resolution playback with formats like DSD and FLAC. You can stream music to the player via built-in Wi-Fi, Bluetooth, and Apple AirPlay 2, then send that same selection out to compatible speakers and components in other rooms, thanks to HEOS technology. The NA6006 can play high-res files with sampling rates up to 24-bit/192kHz, for sound that can exceed CD quality. You can stream them over your wireless network, or load them onto a thumb drive for playback through the front-panel USB port. It can also play DSD files from your music server, or a thumb drive. Apple AirPlay 2 lets you stream audio from your iPhone® or iPad®, and that includes soundtracks from YouTube® videos and Netflix movies. If you have a networked computer running iTunes®, you can also use AirPlay 2 to send music from your library to the NA6006 for playback. If your iPhone or iPad is connected to the same network as your computer, you can use the Apple Remote app to control iTunes playback. Even without AirPlay or Wi-Fi, you can enjoy instant wireless music streaming over Bluetooth from any compatible smartphone, tablet, or computer. 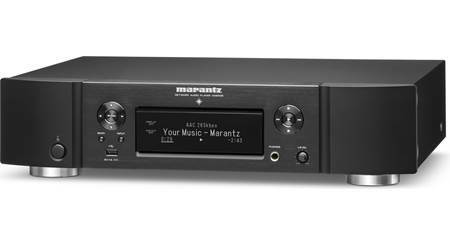 Audiophile Construction: The Marantz NA6006 network audio player is crafted with strong materials that elevate audio quality. It achieves a solid foundation from a dual-layer chassis, while individual circuit boards prevent mutual interference. Fully optimized to reproduce the best audio performance possible, the compact signal paths reduce distortion and improve sound. Multiple high-speed, high-current Schottky barrier diodes provide rapid recovery time and reverse current protection. Premium passive and active components, like audiophile-grade capacitors and precision-tight tolerance resistors amplify precision sound and audio quality. Exclusive HDAM Technology: Included analog circuitry combined with acclaimed Marantz Hyper-Dynamic Amplifier Modules (HDAMs) creates wide dynamic range and lower distortion. Built from separate components and optimized for exceptional sound quality, these miniature HDAMs are found in Marantz products up to the Reference Series players and amplifiers. Marantz developed these HDAM discrete circuit boards to replace standard IC's. The HDAM's consists of discrete surface mount components with short mirror image L/R signal paths. Those devices are doing exactly the same thing as the Op-Amps, but outperform the regular IC Op-amps dramatically in terms of the Slew Rate and reduced noise level, resulting in a much more dynamic, accurate and detailed sound. 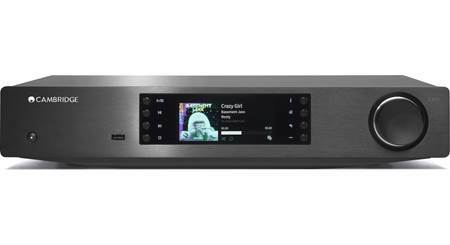 24-Bit/192kHz DAC: The Marantz NA6006 is equipped with an audiophile-standard ESS9016 Sabre DAC with dual crystal clocks to ensure accurate handling of all digital signals for superb audio performance. 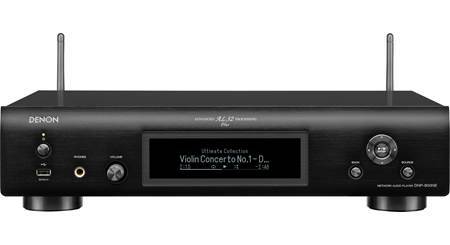 The upgraded digital-to-analog converter (DAC) supports high resolution audio (up to 24-bit/192kHz and DSD 5.6MHz). Marantz Musical Digital Filtering (MMDF) Technology: The NA6006 features unique Marantz Musical Digital Filtering (MMDF), inspired by our audiophile reference class technology. This proprietary DSP technology lets you choose from two selectable, digital filter characteristics to precisely tailor the sound to your liking. Each algorithm handles those minute details of your music with care, transforming new media files for exceptional high-resolution audio playback. Peripheral Circuitry Off Function: The NA6006 has functions to turn off the WiFi, Bluetooth, headphone output circuit, variable audio output circuit, and digital output circuits, as well as the display to prevent noise from surrounding circuits from entering the audio signal output from the unit. Optical Digital Input & Output: An optical (toslink) digital output is provided for connection to your home theater network audio player or other component. The unit's optical (toslink) digital input lets you use the NA6006 as a DAC with other digital audio sources. The optical (toslink) digital connections support Linear PCM signals (stereo) with sampling frequencies of 32, 44.1, 48, 65, 88.2, 96, 176.4, & 192 kHz. Note: The digital input & output are not compatible with Dolby Digital, DTS, or DSD audio formats. Stereo Analog Output (Variable or Fixed): The NA6006 network audio player is outfitted with analog stereo RCA outputs that can be set to fix or variable. This selectable fix or variable stereo RCA output is used to connect directly to an AV or stereo receiver, powered or active speakers, and integrated or power amplifiers. Headphone Amp w/ Gain Control: The NA6006 also employs a high-quality dedicated headphone amplifier, which features its own output stage that's also equipped with HDAM-SA2 devices along with a precision variable analog volume & gain control. The gain control features three different selections (High/Mid/Low), making it possible to seamlessly drive low- or high-impedance headphones. There is a 1/4" headphone jack on the front-panel. Wired or Wireless Network Connection: The Marantz NA6006 offers a wired or wireless network connection. Either network connection gives the network audio player access to HEOS music apps (like Pandora, Amazon, or Tidal), TuneIn Internet Radio, Spotify Connect, your music library on your Apple iOS or Android device, as well as music content on your Windows PC or DLNA music server. Ethernet Jack: The Marantz NA6006 network audio player is fitted with a RJ-45 Ethernet (LAN) port to make a wired connection from the network audio player to your home network. Built-in WiFi: The network audio player also offers built-in WiFi (IEEE 802.11 a/b/g/n; 2.4/5GHz) for a wireless network connection; WPS, WEP, WPA-PSK (TKIP), WPA-PSK (AES), WPA2-PSK (AES) security protection is supported. Wireless network setup can be done via WPS button, Access Point Scan, Manual, or shared through your Apple iOS device (7.0+). TuneIn Internet Radio: The Marantz NA6006 includes access to more than 100,000 free internet radio streams from all corners of the globe via the built-in TuneIn online music service. Simply select TuneIn from the network audio player's menu using the included remote and browse among the 100,000 stations neatly organized into popular categories and select a station that appeals to you. Spotify Connect: If you subscribe to Spotify Premium and have the Spotify App on your Apple iOS or Android mobile device, you can stream Spotify to the Marantz network audio player. Spotify is a digital music service that gives you on-demand access to one of the largest music libraries in the world (over 15 million tracks and counting). Spotify makes it easier than ever to discover, manage, and share music with your friends. You can browse music by artist, album, track, or most popular; and create your own music library with customized playlists. HEOS Music Apps: With built-in HEOS technology and the HEOS app (for Apple iOS 8.0+ and Android OS 4.0) on your compatible Apple iOS or Android mobile device, you'll be able to stream a wide variety of online music services (fees may apply), plus the music library of your mobile device through the Marantz network audio player. Mobile Device Streaming: Using the HEOS app on your Apple iOS or Android mobile device, you are able to stream your device's music library to the Marantz network audio player. You'll be able to browse your music library by Artist, Album, Genre, and Song; control music playback functions like Play/Pause and Previous/Next Track; and view song/artist info with Album Art from the app on your compatible mobile device. You can even type in an artist name or song title to find music in your mobile device's library. HEOS Wireless Multiroom Audio: Built-in HEOS technology enables the NA6006 to become part of the HEOS by Denon wireless multi-room audio eco-system, allowing you to stream and control all of your local and online music effortlessly from anywhere in your home with the HEOS App on your compatible Apple iOS or Android mobile device over a wireless WiFi network connection. The HEOS system is a true multi-room audio system that automatically synchronizes audio playback between multiple HEOS devices so that your music (up to 24-bit/192kHz Hi-Res audio) coming from different rooms is perfectly in sync and always sounds amazing. You can play the same audio source in every room or any combination of rooms you choose, including a different song in every room. Systems & Groups: The HEOS wireless multi-room sound system can support up to 32 HEOS speakers, receivers, players, amplifiers, and/or pre-amplifiers (all sold separately) on a single wireless network (IEEE 802.11 g/n; 2.4/5GHz). You can join or group up to eight individual HEOS devices into a group that function as if they were a single source. The HEOS eco-system is flexible enough where you can create up to 16 Groups (2 Heos devices per Group). You can easily group 16 rooms together with Party Mode by simply using a "pinch" gesture. Incompatible Sources: The player's optical (toslink) digital input does not support multi-room distribution. DLNA 1.5 Certified: The NA6006 is DLNA (Digital Living Network Alliance) 1.5 and Windows 7/8/10 compliant for audio networking. This means it's easier for you to access and enjoy digital music stored on your Windows PC. The network audio player can wirelessly playback High-Res music content from your PC, while using the included remote control to browse your music library. The unit supports ID3-Tag (ver.2) and META tag information; so song title, artist name, and album name can be displayed on the unit's front-panel LCD. 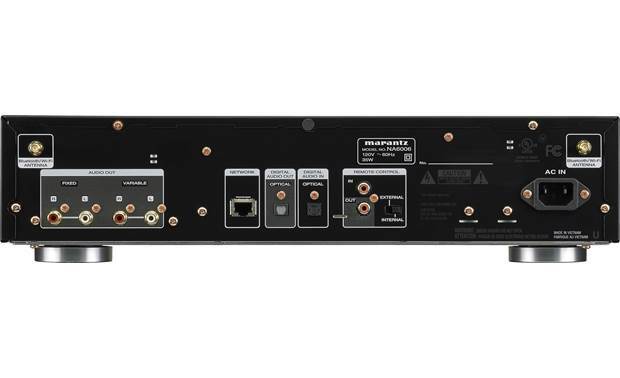 The Marantz NR1609 supports the following audio formats, sampling frequencies, and bit rates via its wired network connection. Front-Panel USB Port: The Marantz network audio player is equipped with a front-panel USB (type-A) port that allows you to enjoy a variety of music files from a USB mass storage class memory device; such as a USB thumbdrive or portable HDD (a portable hard disk drive will require an external power supply). Compatible USB storage devices must be formatted in FAT 16 or FAT32 (a FAT16 device can have up to 2GB of storage, while a FAT32 device can have up to 2TB of storage). The unit can recognize up to 500 folders/500 files. You can use the network audio player's remote control to navigate your stored music files on your connected USB memory device. Song/artist information will display the network audio players front-panel LCD. USB devices that can be charged via USB will be charged when plugged into the network audio player's USB port (5V/1A); even in standby mode. Charge your smartphone with the USB port, even if the NA6006 is in standby. Once the device is fully charged, the NA6006 automatically enters a low-power standby mode for minimal power consumption (0.3 Watt). The network audio player's USB port is not compatible with Apple iPod/iPhone/iPad, Android OS devices, USB hubs, and computers. Built-in Bluetooth: The Marantz NA6006 features built-in Bluetooth (version 3.0+EDR) with a 98.4' wireless range for music streaming (A2DP 1.2) and control (AVRCP 1.5). You'll be able to wirelessly connect to smartphones (including iPhone & Android), tablets (including iPad & Android), laptops (including Microsoft Surface & Macbook), computers (including Windows PC & Mac), and other Bluetooth-enabled devices. Up to eight Bluetooth devices can be remembered by the NA6006, so family members as well as friends can enjoy their favorite tracks (only one device can be used at a time). Wireless Music Streaming: You'll be able to wirelessly stream stored music, music apps, and other audio content from your Bluetooth-enabled source device to the Marantz network audio player. The network audio player supports the Bluetooth SBC codec only. Wireless Music Control: You will also be able to control basic playback functions (Play/Pause, FF/RW, Skip) using the network audio player's remote control. Advanced music operation will still need to be handled from your Bluetooth-enable device. There is no song/artist information display on the network audio player. Continue to use your Bluetooth device's screen to view song/artist info. Due to the differences in Bluetooth technology, some Bluetooth enabled devices may be incompatible, function improperly, or may not support all features when used with the Marantz network audio player. AirPlay 2 (via available firmware update): Through an available firmware update, the Marantz network audio player will support AirPlay 2. AirPlay 2 is an advanced and easy-to-use wireless multiroom audio platform for iTunes, Apple Music, and other compatible Apple iOS apps. With AirPlay 2 you can play any sound from your Apple iOS device (running iOS 11.4 or later) or Mac computer (running OS X 10.13.2) on the Marantz network audio player and other compatible AirPlay 2 speakers throughout your home. You will also be able to ask Siri-enabled devices (like your Apple iPhone, iPad, or Watch) to control playback of your Apple Music on the Marantz network audio player. With AirPlay 2, also get to see song/artist information via the network audio player's front-panel LCD. You can choose to play audio in one room, play the same audio in grouped rooms, or play the same audio in every room (you can control and group directly from Apple's Music App and Home app on your Apple iOS device). You can even watch videos and movies from YouTube and Netflix on your compatible Apple iOS device or Mac computer with perfectly synced audio on the Marantz network audio player. HEOS App: You'll need to download the HEOS App (for Apple iOS 8.0+ and Android OS 4.0) onto your compatible Apple iOS or Android mobile device to enjoy HEOS functionality through the NA6006 network audio player. Using your compatible mobile device and the HEOS app, you can setup, browse, explore, and control HEOS system right in the palm of your hand, from anywhere in your home. Your compatible Apple iOS or Android device must be connected to the same home wireless (WiFi) network as the network audio player and your entire HEOS system. The HEOS app consists of 4 control screens. Settings: The "Settings" screen enables you to connect one or more HEOS speakers, network audio players, amplifiers, and/or pre-amplifiers to your home's wireless network. Music/Sources: You can select what music and which source you want to listen to from the app. Choose from online music services like Pandora, Spotify, TuneIn, Tidal, etc. ; your music library on your Apple iOS or Android device; Windows PC or DLNA music server, and USB or Bluetooth audio. You can also select music from Playlists you've created, Favorites you've saved, and your recent listening History. Josh.ai Smart Home Voice Automation: An elevated voice agent for the high-end smart home, Josh.ai offers flexible voice control for nearly any aspect of your day-to-day experience and entertainment environment. Use voice commands to control the Marantz network audio player, thermostat, lights, home appliances, powered speakers, and more. Josh.ai is installed by custom integrators and accessed through the Josh - Home Automation app on your Apple iOS 10.3+ or Android OS 4.4+ device. 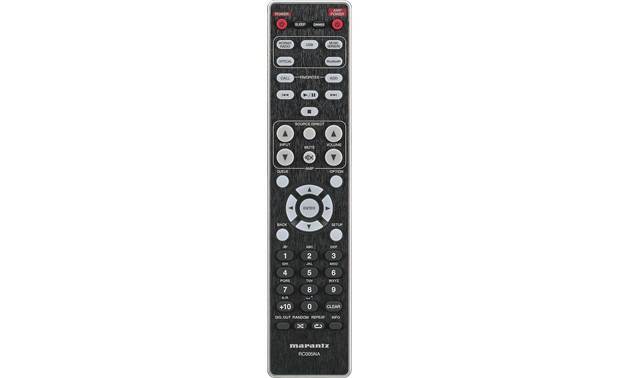 Remote Control: The Marantz NA6006 includes an ergonomic IR remote control for wireless operation of the network audio player and its various sources, as well as Marantz integrated amplifiers. The Marantz NA6006 is also outfitted RCA input & output connectors that allow you to connect the NA6006 to a Marantz component equipped with remote control (RC-5) terminals for combined remote control. Favorites: The Favorite function allows you to register your favorite stations and files in the Favorite List in advance so that you can call and listen to the stations or files right away. The content that you can register and recall are Internet radio stations, online music services, DLNA music servers, and USB. You can register up to 50 items in the Favorite List. Front-Panel Display Dimmer: The Marantz network audio player features 4 display settings for the front-panel LCD window; 100%, 70%, 40%, and Off. You can set the front-panel LCD to display English, French, or Spanish text. Auto-Standby: If there is no input signal or operation for 1 to 99 minutes, the Marantz network audio player will automatically go into Standby mode. Software Updates: Using the network audio player's network/internet connection, you can check for and update the latest firmware from the online Marantz server. You can also set the network audio player to automatically download the latest firmware and software updates when it is in standby mode. Visit Marantz's Owner's Circle for access to downloads to keep the Marantz network audio player up-to-date. Can conect directly to active/amplified speakers? As well if I want to conect to other pre amp (where I have conected my turntable as well) can I disconnect/bypass the Marantz preamp? Searches related to the Marantz NA6006 Network music player with Wi-Fi®, Bluetooth® and Apple® AirPlay® 2.